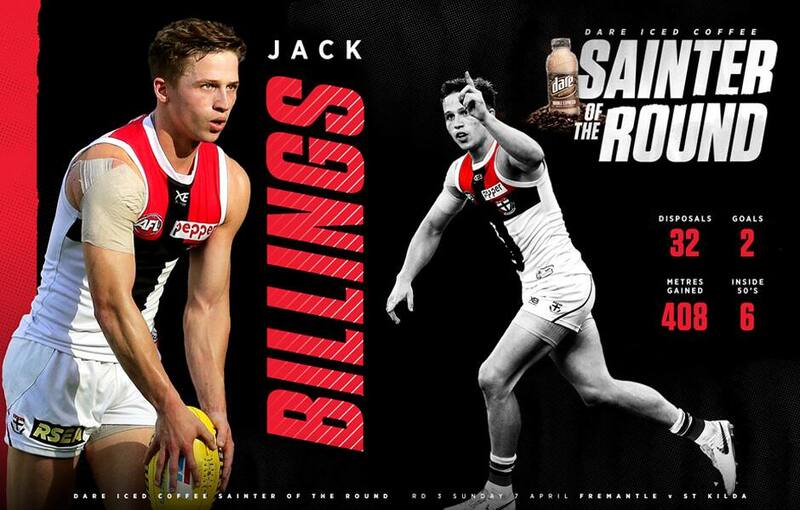 Jack Billings edged out two fellow young guns to be voted by you as this week's Dare Iced Coffee Sainter of the Round. The fans have spoken, and Jack Billings is the Round 4 Dare Iced Coffee Sainter of the Round. Billings was the pick of the bunch from more than 1,500 fans who submitted their 3, 2, 1 after Sunday’s heart-breaking loss to Fremantle. The classy left-footer collected 32 disposals and bagged two goals, including a snap from the pack in the dying seconds to give the Saints a last-gasp chance at victory. After being added to the leadership group on the eve of the season, Billings has put together an impressive three weeks in a new midfield role. Playing predominantly on the wing, Billings is averaging 29 disposals a game and doing plenty of damage with his penetrating left foot. Fellow midfielder Jack Steele has also started the season well and edged out Rowan Marshall for the two votes in Round 4. Steele finished with 22 touches, eight marks and 10 tackles in a battle with Brownlow medallist Nat Fyfe, before the Dockers captain left the field with concussion. Marshall was the clear pick for the one vote, with fans appreciating his work around the ground. The ruckman racked up 40 hit-outs and six tackles to go with 16 disposals. The Dare Iced Coffee Sainter of the Round will be awarded each week, with the votes tallied at season's end to anoint the fan-voted MVP award.